2019 marks the 30th year of the National Hydrological Monitoring Programme (NHMP). For the last three decades, the NHMP, run by the Centre for Ecology & Hydrology and the British Geological Survey, has been documenting the hydrological conditions of the UK and identifying and interpreting long-term changes and variability – an essential prerequisite for the development of policies to address the impacts of global warming. A mainstay of the NHMP has been the Hydrological Summary, the monthly report describing the hydrological conditions during the preceding month and placing that situation in a historical context. The first Hydrological Summary was published in January 1989, at the behest of the Department for the Environment (as it was then) following dry conditions in late 1988. Reporting of a similar nature had followed the 1984 drought but did not lead to an ongoing series at the time. The December 1988 summary, however, became the first of very many – an almost unbroken monthly series which now spans three decades. "A mainstay of the NHMP has been the Hydrological Summary, the monthly report describing the hydrological conditions during the preceding month and placing that situation in a historical context." That report described conditions in December 1988, a month which saw near average conditions but came with warnings that there ‘was some concern expressed in relation to river flows’, although there was 'no cause for alarm [as the] rankings point to a notable but not remarkable situation'. As we now know, the situation deteriorated and as recorded in the NHMP’s 1988-92 Drought Report this dry period affected much of Europe. 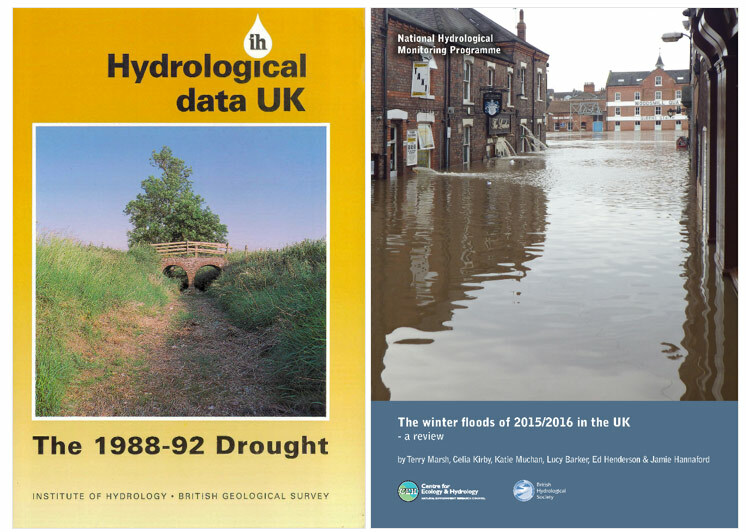 Above left: England and Wales Water Situation Review 1988/89 – December. 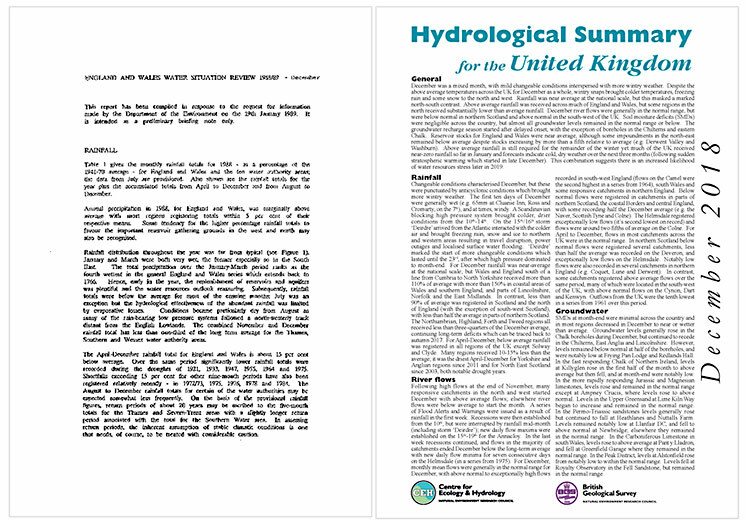 Above right: Hydrological Summary for the United Kingdom – December 2018. The three decades following have certainly been no less eventful at times, and there has been a succession of major hydrological events, both droughts and floods – many of which have broken long-established records, only for those records to fall again, leading to a feeling that events have become more extreme. The reality is that this is actually a very complex issue – the UK climate is inherently variable and it’s difficult to compare events (in terms of the flood magnitude, spatial extent, impacts etc) but we’ll return to this later. Major hydrological events have been recorded in reports, academic papers and blog posts by the NHMP, all of which have the same aims, structure and themes – a comprehensive assessment of the event in terms of rainfall, river flows, groundwater and reservoirs as well as impacts of the events and where they sit in a historical context. They allow us to accurately record events, and enable us to draw important comparisons with previous events and identify resilient trends, which in turn allow those charged with management of the environment to make necessary changes and improvements. Above: Two NHMP reports – then and now, both lead authored by Terry Marsh. The work carried out by the NHMP team has made a contribution to the public debate around floods and droughts over the years. There has, inevitably, been media interest in the Hydrological Summaries in the wake of major events, and NHMP team members have regularly given interviews, providing a more public face to the reports. 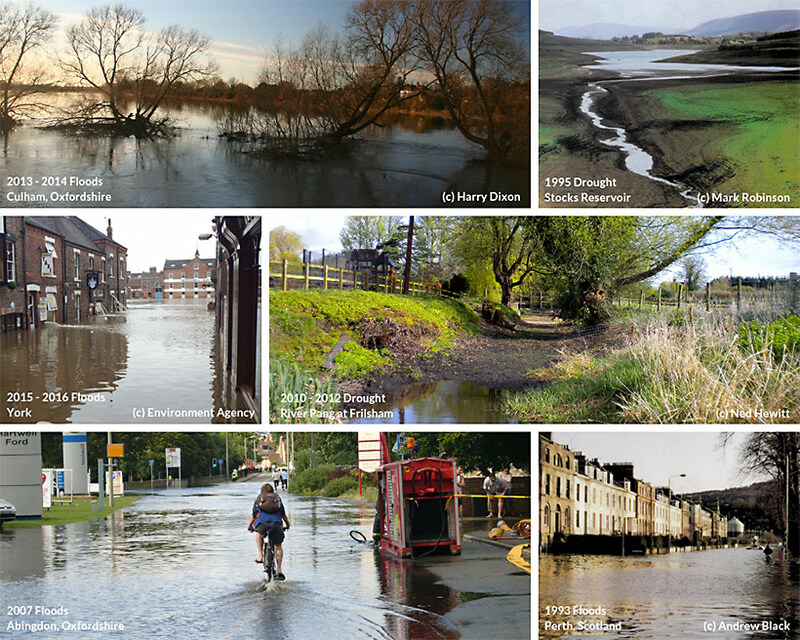 There were more than 1000 separate media articles on drought and subsequent flooding which quoted NHMP outputs from 2010 up to the end of 2012; team members also engaged in more than 20 TV and radio interviews for outlets including the BBC and Sky News. Some of the reports have gone on to inform other reviews and enquiries including written and oral evidence to parliamentary select committees. After the devastating summer floods of 2007, NHMP assessments of the event, its magnitude, impacts and description of the issues related to measuring high flows informed the Pitt Review which was described as "one of the widest ranging policy reviews ever carried out in the UK". During the winter flooding of 2015/2016 the NHMP were prominent in national papers, on national radio and the resulting report was featured in the Environment Agency’s review of the impact of the event. Many people have been involved with the NHMP over the years, contributing to the Hydrological Summaries, reports, blog posts, academic papers, briefing notes and outreach talks. A lifeblood of the NHMP has been Terry Marsh, who instigated the Hydrological Summaries and reports and, alongside Felicity Sanderson, authored and produced every Summary between 1988 and 2006 – certainly a monumental undertaking, particularly as the authoring process is now distributed through the team. No look back at the NHMP would be complete without some data! The graph below shows the average annual river flows from the UK outflow series over the 30-year NHMP period. 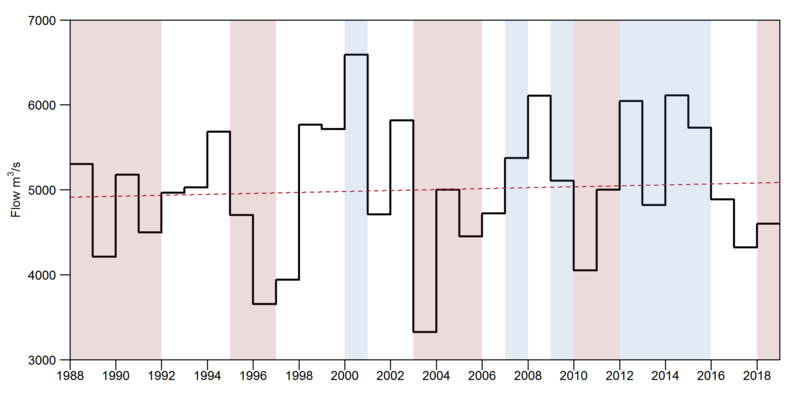 Shading represents major events as mentioned previously, and the year-to-year variability is clear to see. We have certainly seen a host of major hydrological events over the three decades, which has inevitably fuelled speculation that floods and droughts are becoming more severe. However, we would expect to see many flood and drought episodes, somewhere in the UK, over a three-decade period. The question of whether we have seen more extremes, or more variability, is best answered by analysing long river flow records to examine evidence for trends. This is another area of science covered by the NHMP’s mandate, and one which the team has made an active contribution to over the last three decades. At the UK scale at least, the graph above shows that annual mean flows do show a weak upward trend, and this is telling of the spatially and temporally variable nature of flooding and drought events. As we know, events don’t always occur at the national scale, and can mean the real extremities can be lost on overview plots like the above. The NHMP team has conducted trend analysis at a range of scales, from individual catchments through to the national scale – the latter, notably, using a ‘Benchmark’ network of near-natural catchments and regional runoff series. These analyses typically cover a much longer period than the 30-year NHMP window, going back to the 1960s or 1970s when most river flow records began, and sometimes earlier. A 2015 review provides a good jumping-off point for the NHMP’s trend analysis work (alongside many other studies). NHMP team members have also collaborated on a host of international studies, representing the UK in European and intercontinental scale trend analysis papers. Taken together, this body of work has helped inform the debate around whether river flow regimes are changing, both nationally (e.g. the work was featured in the National Ecosystem Assessment) and internationally (the trends papers have been cited in European Environment Agency and IPCC reports). The benefits of regular and consistent hydrological reporting are clear and the NHMP remains an authoritative voice on UK-wide hydrological status and monitoring. While many of our methods remain the same (and rightly so), in 2019 we have many more tools at our disposal than our forebears. 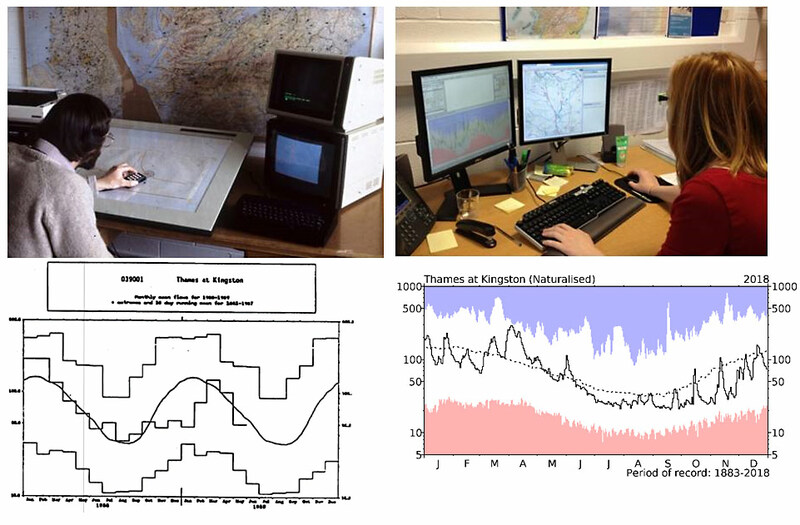 NHMP staff contribute to the Hydrological Outlook which, since 2013, has provided an insight into future hydrological conditions across the UK and allows us to more robustly assess what is happening next. CEH's COSMOS-UK network provides near real-time plot-scale soil moisture data for use in a variety of applications, which helps NHMP reporting in the present and opens up avenues for integration in future. The UK Drought Portal is an example of a different approach to situation monitoring, which allows users to visualise the current meteorological conditions across the UK in a web-based interactive environment, and understand the severity and magnitude of droughts (and wet periods) at different spatial scales across the UK over the past half century. "The benefits of regular and consistent hydrological reporting are clear and the NHMP remains an authoritative voice on UK-wide hydrological status and monitoring." These applications feed into the suite of tools that allow the NHMP to continue its obligations to monitor and report on the UK’s hydrological situation. Lots of work has gone on behind the scenes to maintain data standard and quality while delivering a consistent product and, we should note that, the National Hydrological Monitoring Programme would never have achieved so much without the support of its partners. Thanks go out to the British Geological Survey, Met Office, Environment Agency, Scottish Environment Protection Agency, Natural Resources Wales, Department for Infrastructure – Rivers, the UK Water Companies and many others. What does the future hold? New science and technologies like those mentioned above are revolutionising monitoring and forecasting, and there is a growing trend towards interactive, dynamic web tools like the Drought Portal and COSMOS-UK portal. But the user community still values the historical context and contemporary interpretation provided by the Hydrological Summary. Certainly, the demand for timely and authoritative monthly reporting will continue to grow as (is most likely) an even greater range of hydrological variability becomes manifest in our changing climate, and the need to index emerging trends becomes ever greater. 1 There was no Hydrological Summary in September 2000 because the Foot & Mouth epidemic meant that river flow data could not be downloaded from rural gauging stations. 2 There are a number of accounts of flooding in the 1990s which were covered in hydrological yearbooks, rather than separate reports.